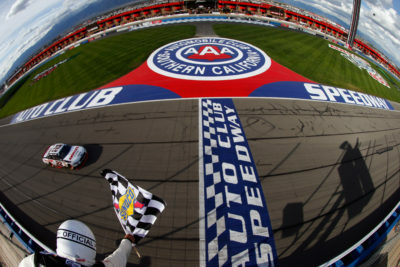 Auto Club Speedway. It is his 4th Top 10 finish in 2018. 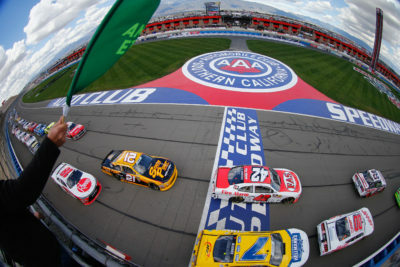 3rd Place Car 1 Elliott Sadler Cessna Chevrolet, started from 11th place posted his 10th Top 10 finish in 14 races at Auto Club Speedway. 4th Place Car 3 Austin Dillon Red Kap/Prudential Overall Supply Chevrolet, started from 19th place followed by 5th place Car 21 Daniel Hemric South Point Hotel & Casino Chevrolet, started from 5th place. 6th Place Car 00 Cole Custer Haas Automation Ford, started from 4th place. 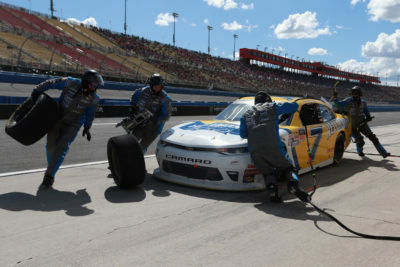 7th place Car 9 Tyler Reddick # Nationwide Children’s Chevrolet, started from 16th place was the highest finishing rookie. 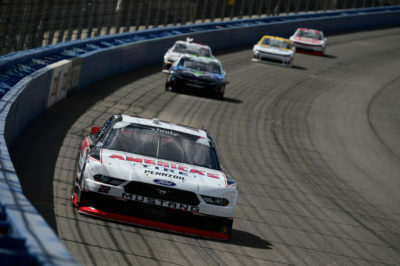 8th Place Car 2 Matt Tifft Anderson’s Maple Syrup Chevrolet, started from 20th place followed by 9th place Car 18 Ryan Preece Rheem Toyota, started from 8th place. Lastly in Top 10 was Car 4 Ross Chastain Daley Technology Systems Chevrolet, in 10th place, started from 13th place. Elliott Sadler leads the point standings by 4 points over Tyler Reddick. Chevrolet, Car 20 Christopher Bell GameStop/Turtle Beach Toyota Crash in Turn 4. 5th Caution on lap 111 for Fluid on Track From Car 28 Dylan Lupton thinQ Technology Partners Ford. 6th Caution on lap 122 for Debris Turn 2. 7th Caution on lap 140 for Debris on Frontstretch. 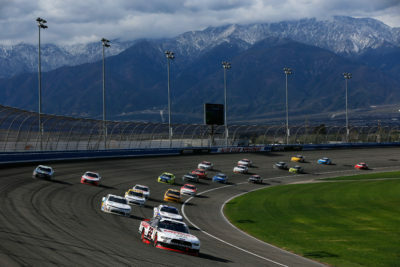 The race had 6 Lead Changes among 5 drivers: C. Bell # 1-4; J. Logano(i) 5-121; J. Allgaier 122-123; E. Sadler 124-127; J. Logano(i) 128-140; R. Sieg 141; J. Logano(i) 142-150.
Credit: 354784Robert Laberge/Getty Images Joey Logano, driver of the #22 Discount Tire Ford, leads a pack of cars during the NASCAR Xfinity Series Roseanne 300 at Auto Club Speedway on March 17, 2018 in Fontana, California. Race Comments: Prior to the start of the race, the following cars dropped to the rear of the field under penalty for reasons indicated: #28 (Backup car). Failed to Qualify: N/A. Time of Race: 2 Hrs, 21 Mins, 25 Secs. Average Speed: 127.283 MPH. 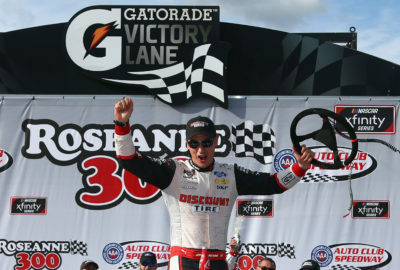 Margin of Victory: 1.429 Seconds. Caution Flags: 7 for 32 laps. Lead Changes: 6 among 5 drivers. Mahle Clevite Engine Builder of the Race: Roush-Yates Engines, #22. Mobil 1 Driver of the Race: Justin Allgaier, #7. Sunoco Rookie of the Race: Tyler Reddick, #9. Next Race: Apr. 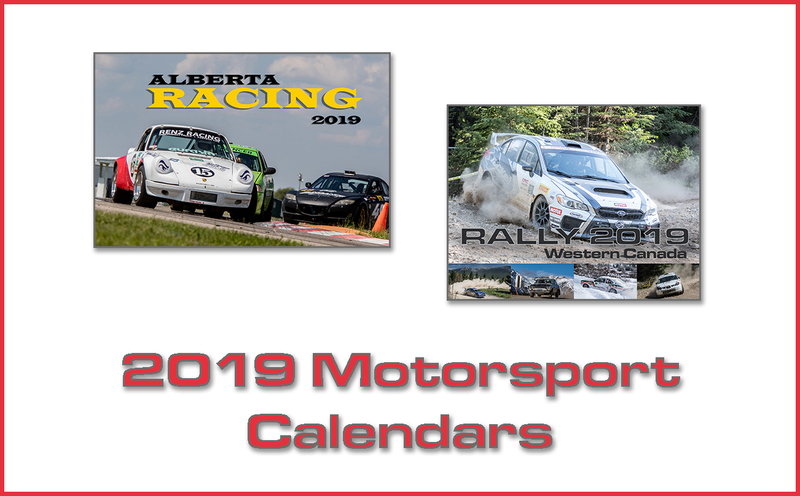 7, 2018 – Texas Motor Speedway.